Without the help of the Harriman estate in New York, the Utah State Capitol as we know it might never have been built. In 1901, the Utah legislature passed an inheritance tax law which, ten years later, would change the very face of the state. The law stated that the stock of a Utah company, held by a resident or non-resident, was subject to taxation. Utah did not enforce the law until Attorney General A. R. Barnes took office in 1909. A few small inheritance tax payments were made in 1910. 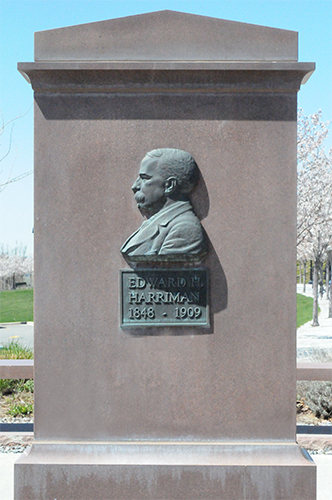 Meanwhile, railroad tycoon Edward H. Harriman had passed away in September 1909. As president of the Union Pacific Railroad, which was incorporated under Utah state law, Harriman had invested in a trolley car system in Salt Lake City. At the time of his death, Mr. Harriman owned $15,980,937 in company stock and his estate was left entirely to his wife, Mary W. Harriman. Under Utah’s inheritance tax law, Mr. Harriman’s Union Pacific Railroad stock was subject to a five percent tax (after a $10,000 legal exemption); Mrs. Harriman paid almost $800,000 in taxes to the State of Utah. Governor William Spry recommended that $750,000 of the funds be dedicated to building a capitol. The legislature responded with a $1 million bond, and a project budget was set.